Imagine being cooped up in your living room, day after day without a TV to watch, a book to read, without music to dance to, without anything to pass the time. What the heck would you do all day?! Such are the lives of sugar gliders who do not have the proper toys and activities given to them by their humans. So what are some of the things that can bust their boredom, spark their spirit and perk their pep? To know this, you just have to watch. Over the years I have grown to love watching my gliders play at night. I not only find it endearing and entertaining, but it also helps me to understand them better, their routines and what makes each individual glider tick. I have one that has always been a tail carrier, one who plays by chewing and destroying things, one who has never been a big player, and one who plays until the cows come home. I have also recently discovered that Bindi, my special baby, has learned to tail carry after six years (so exciting!) and has discovered that she can carry just about anything. If she can’t carry it back to her pouch by tail, she’ll carry it by mouth. Since it’s a new thing for her, she’s on carry overdrive right now. I even take her carried stash and re-hang it a few times throughout the night just because she’s getting so fast at it. Most of us are night people right? (Hence…we have sugar gliders.) Well take some time to sit quietly and watch. Let them forget that you are there (this is key) and go about their business. If you sit hush-hush long enough, they’ll stop paying attention to the humans in the room and start living the night life. Do it often, as their habits change over time. 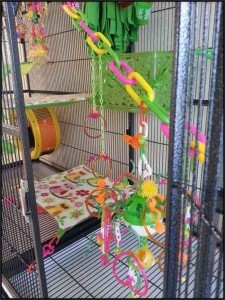 ¤ Try to have enough safely made toys in the cage to keep them moving. 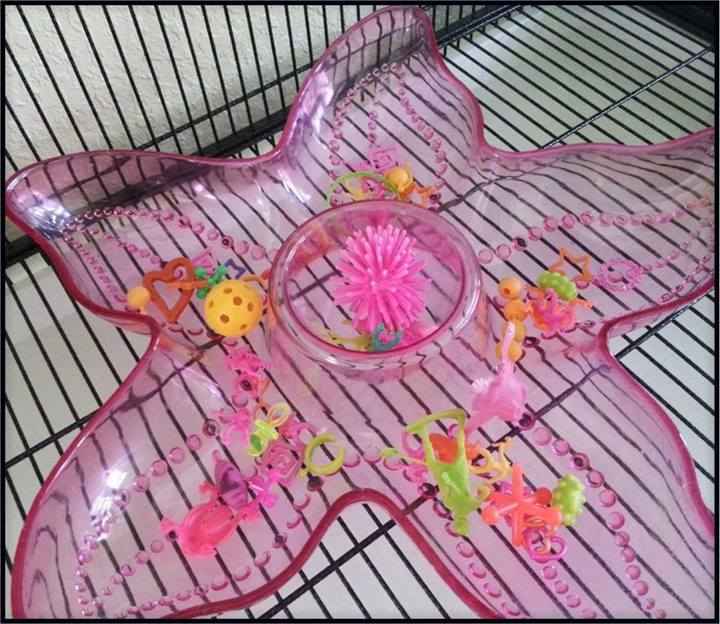 A toddler doesn’t stay on the same toy for very long and neither do sugar gliders. Both have short attention spans, both ditch one thing to do another and they always come back again. They’re rotators. 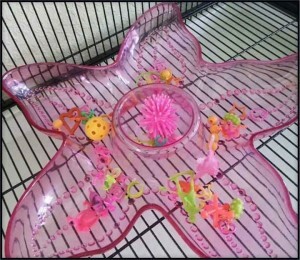 ¤ Try to always keep a toy at mid-level, the center of the cage. 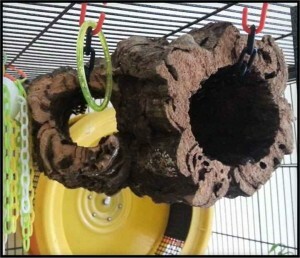 Using a foraging toy will entice them to climb, especially if there’s food in there! ¤ Reset toys are great because they give gliders something to work at. Set the parts on the toys, gliders work to get them off, reset them again so their fun starts over. ¤ I can’t say enough about toy bins. Besides their wheels, toy bins are the hub of fun at our house. Not your typical ball pit either. Balls can only be entertaining for so long. Mine use one toy bin at mid-level and one on the cage floor. By the way, heavy plastic veggie trays work great as a floor toy bin. Fill them diverse plastic chew things. (See photos for ideas) Small things that they can pick up and feel. Texture. Noise makers. And if you have one like my Chloe, things they can throw. If there are enough chew things in the bins, gliders will be less inclined to chew things you don’t want them to. ¤ Why not give them some natural climbing surfaces relative to what they’d have in the wild? I love using cork bark, grapevine and manzanita perches. They love to use them. ¤ Sewn hammocks come in different sizes. Have at least one of them tight fitting. It gives them a bounce spot. Smaller hammocks can work, just add C clips until the length is reached. ¤ Have enough safely sewn corner hammocks and bridges around the cage to give them a place to hang. Someone once told me that their gliders only use a portion of their cage. Gliders aren’t going to hang out in voided spaces. Mine are all over the cage. No space is left unused because I try to make every space useable. ¤ On the flip side, don’t crowd the cage. Human hoarders don’t move around easily. Don’t force your gliders to live the hoarding life. If it’s not useful, don’t use it. Make room for something that is. 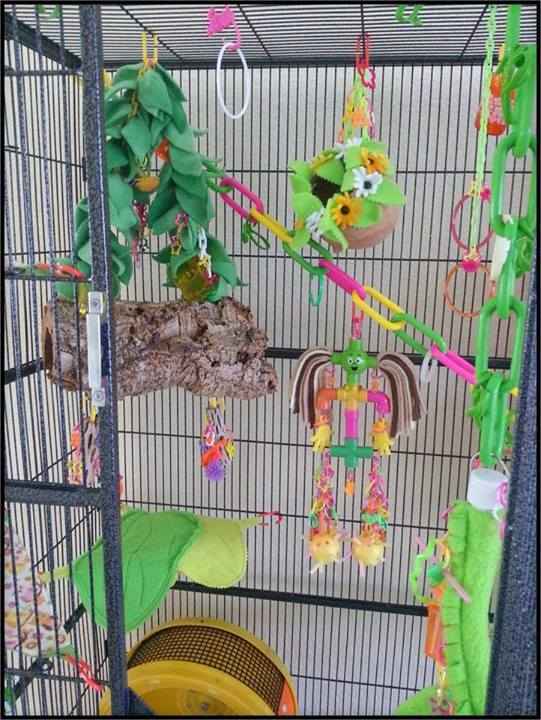 None of my gliders use fleece vines so I replace them with harder surfaced climbing things, which they prefer. ¤ Treat cups. Everywhere!! 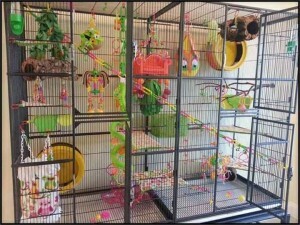 Ok, maybe not everywhere but a good amount spaced evenly throughout the cage. 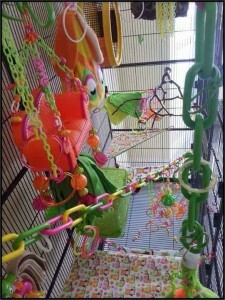 On toys, hung safely on branches, C clipped to the cage bars…it’s fun for them to hunt for treats. Not just treats either. Feeding green beans, bell peppers and blueberries tonight? Why not separate them from the staple on the floor and use the hanging treat cups instead? They love it! 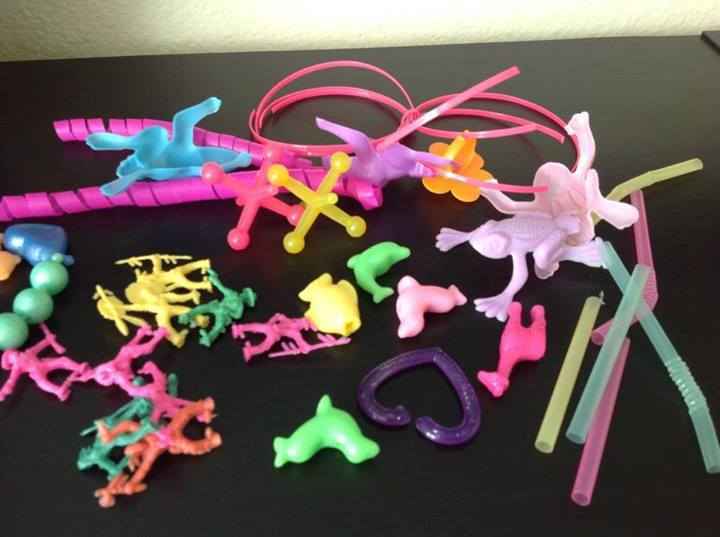 ¤ Plastic milk and juice rings are great and nearly free! CUT them off of the bottles and hang them in various places. If you have tail carriers, they carry them. If not, they’ll handle and chew them. Cutting them off of the bottles is very important though. Never leave a ring whole. They often try to ‘wear’ them by sticking their heads through and wriggling them down to their waists. With a cut milk ring, nary a ring will get stuck. I always have a replenishing drawer full here for a constant supply. My household knows…if you chuck an uncut, unwashed milk ring in the recycle bin instead of the drawer, you’ll feel the wrath of my nag! ¤ Cut some straws up and throw them in toy bins for chewing. Thread some through wiffle balls, they’ll pull them out! For a rare and special treat, partially fill with yogurt and freeze! ¤ Wedge a few yogurt drops or pine nuts into the holes of wiffle balls and hang with C Clips. This is a rare treat and should be used infrequently. ¤ Swap things out for new. 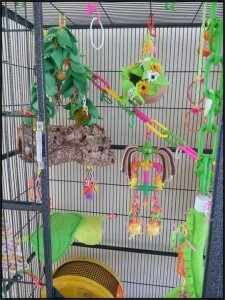 If you don’t have time for a full cage cleaning that week, simply rearrange a few things, replace a couple of toys. Takes a second and sparks visual interest again. I believe that gliders slow down with time. Babies play hard. Adults take it easier. Never deprive your gliders as they age. Elder gliders may not use their toys and playthings as much but just as us humans like to look at art and scenery, gliders will still benefit from the visual stimulation of a well thought out home. Our sugar gliders did not ask to live in a cage…but as their humans, we should be diligent in keeping it a fun place to be. 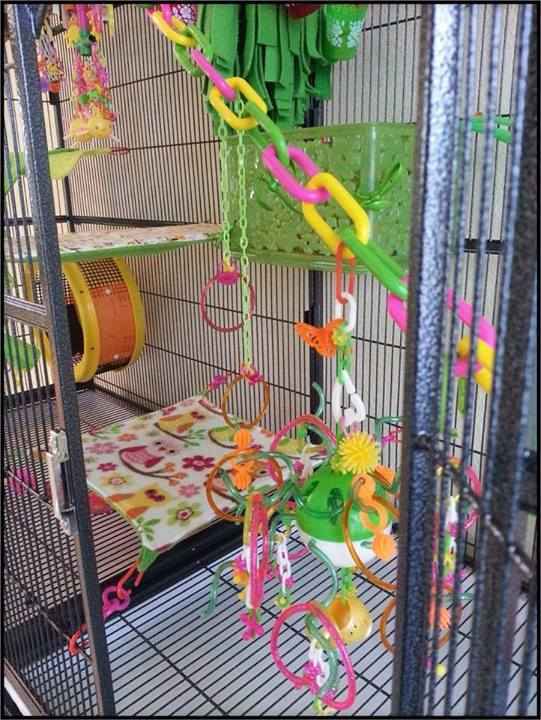 Happy cage = happy sugar gliders. All animals deserve to be happy! This article comes to you courtesy of Spoiled Rotten Suggies! Pretty cute. It’s nice how tame he/she is. The little back feet sicnkitg up look pretty amusing. And the fact that he/she looks down, expecting more and gladly taking it, when you stop petting for a bit is neat as well. Where did you buy your cages? Personally I would do a critter nation, it is very expandable and SO sturdy. 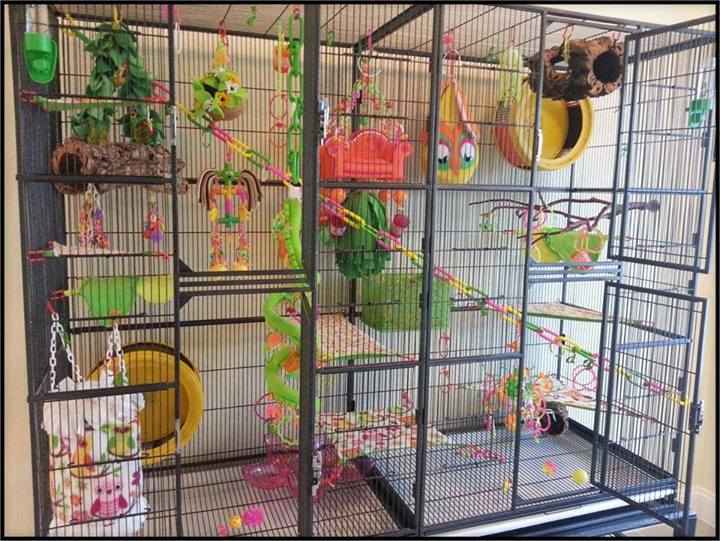 Where can I get a cage like that? If you made it where did you get the materials? Thanks for any help in this area. I am very interested in the cage itself in this picture. Was it a custom cage or did you buy an expandable set? And where would I go to get my own? Thanks in advance, Charlie. What cage is that? Exotic nutrition?? I believe it is two Brisbane cages next to each-other. Are gliders right for you? Happy Ostara – Photo Contest!